More than any other genre of Scripture, the psalms beg to be experienced as much as understood. Psalm Songs Vol 2 is a blessing to the Church, allowing listeners to enter the psalms to really feel the emotion and the truths of Scripture they communicate. 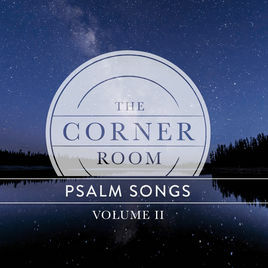 The Corner Room has a unique ability to identify the emotional heart of a psalm, craft music to reflect that and then combine music and direct ESV text into powerful songs that flow naturally and make the heart soar. It is a great testament to the artists and arrangers that they can weave irregular Scripture verses seamlessly into the natural rhythms of their songs. The album begins with a rollicking arrangement of “Psalm 100,” which is reminiscent of the upbeat and hopeful Americana sound of Psalm Songs Vol 1. “Psalm 46” takes the powerful picture of God’s everlasting commitment to us (‘God is our refuge and strength; a very present help in trouble…’) and combines it with a moving piano motif that would make Bruce Hornsby jealous. “Psalm 63” neatly infuses African influence into the acoustic sound that The Corner Room does so well, playing with timing and producing a captivating piece. “Psalm 67” does the same with Celtic influence, crafting a powerful melody with the memorability and gravitas of “Auld Lang Syne.” The album wisely spreads Psalm 139 across three different songs, allowing them to explore the varying emotions at play in that very personal psalm. I think that the greatest testament to the Psalm Songs volumes is the fact that when I read those psalms directly from the ESV text, The Corner Room’s arrangements spring to mind to provide a mental soundtrack and emotional lift that amplifies God’s Word. If you are already familiar with Volume 1, you’ll be delighted with the new musical ideas explored on this new album. If this is your first exposure to The Corner Room, I can’t recommend enough that you invest some time hearing God’s Word communicated so effectively by these songs. Psalm Songs Vol 2 is a devotional treasure that will remain in my playlists for a long time.